Golf is not an easy sport to cover, which is why the PGA Championship just got a digital overhaul. This week at the PGA, golf's final major of the year, 156 players will descend onto The Ocean Course at Kiawah Island for hundreds of hours of collective play. The reality, however, is that only a fraction of the total action will find its way onto your television screen via traditional coverage. Add to that the fact that the first two rounds will air right in the middle of a typical work day, and you have a prime opportunity to supplement traditional broadcast coverage with some fresh material for the digital crowd. For Turner, a digital revamp also means some fancy new ad partners. 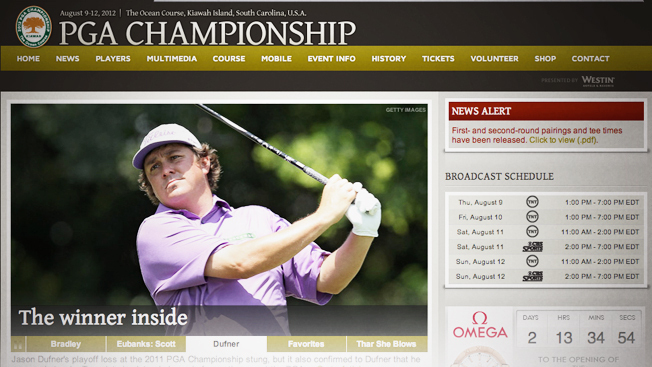 PGA.com's new PGA Championship website is sponsored by blue-chip brands like Mercedes-Benz, Westin, RBC and Omega. Walker Jacobs, evp of Turner digital ad sales, said he believed the partnerships would let Turner "blow out the coverage of the event this year with a completely integrated approach to the tournament." That approach will include a Mercedes-sponsored live video player, sponsored video series and other brand sponsored widgets like RBC's live stat leaderboard. To capitalize on the social media frenzy surrouding live sports, PGA.com will debut Social Caddy, a live and aggregated feed that looks to capture relevant social information from the Twittter, Facebook, and Instagram firehoses. The digital push by the PGA.com is a formidable effort to make golf coverage more accessible at a time when viewers are demanding content on demand more than ever before. The PGA.com's iOS app will feature live coverage of all the Par 3 holes as well as a featured group/pairing in the morning and afternoon rounds of the tournament, in the hopes of appealing to this digitally demanding demographic. For Turner (which just made news in the digital space with its acquisition of Bleacher Report), this appears to be an early example of what looks to be an increasingly digital approach to sports coverage. "The capability technology brings to golf is incredibly exciting and opens the imagination of what it will turn into over time," Jacobs told Adweek. "I believe we will continue to push the boundaries. For example, when you have users authenticate [with their cable providers to stream video online], it allows us to enhance what we can do. I can imagine a time in the future when we can afford the users even more and more control of the entire experience."